The Waterway Iron Might is a great pump for ponds 1500-3000 gallons. Maximum flo is 3000 per gallon. The Iron Might works well with exterior filters like Hayward Bio – Mechanical filters. LOCATION: Place pump on level surface. Pump must be installed below water surface. Shut off valves should be installed on both the inlet and outlet of the pump for future maintenance. Installation area should be clear of any direct water and have adequate floor drainage. 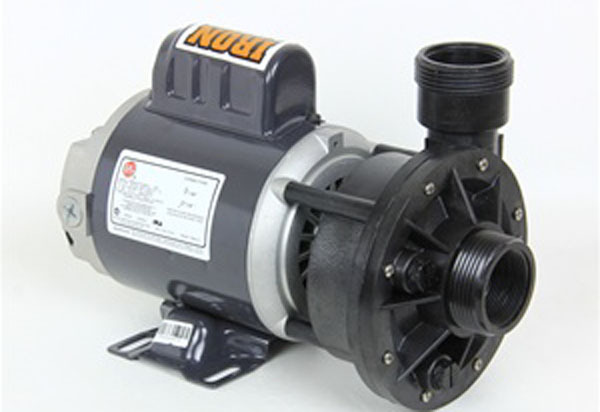 Pump should be protected from excessive moisture. Allow access area large enough to service both pump and plumbing.The inlet and outlet have Waterway male union threads. Use Waterway tailpiece assemblies for best connection.These unions allow the pump to be removed for service without disturbing the plumbing.